“A Backsliders show is like no other..” Far from the Mississippi delta, they took us to the water’s edge, ‘til we felt the riverbed beneath our feet” Rhythms Magazine 2015. 2011 ARIA Blues and Roots nominees and I-Tunes Australian Blues and Roots album of the year winners, Backsliders have been playing, touring the festival circuit and recording for 30 years. Slide Guitarist, multi-stringed instrumentalist, songwriter and vocalist, Dom Turner, is the founding member of the group. Dom’s influences are many and varied – a blend of delta blues, piedmont blues, rock, dub and sounds of Asia. He is a highly regarded speaker on blues and roots music and has guested on ABC (Australian Broadcasting Commission) radio programs and presented music workshops at festivals and in universities both nationally and internationally. As well as playing in Backsliders, Dom has toured as a solo artist in the USA, playing Augusta Blues week in West Virginia in 1996 and 1998, and in early 2006, he toured Mexico with US blues greats, Del Rey and Steve James. In 2004 Dom was voted Songwriter of the Year’ at the Australian Blues Awards in Goulburn, NSW and has a sculpture in recognition of this honour at the Goulburn Visitors Centre. Drum and percussion virtuoso and songwriter Rob Hirst, an acclaimed name synonymous with the best of Australian music, has been with Backsliders for 16 years. As a founding member spending 25 years in Midnight Oil, Rob’s work needs no explanation- he stands as one of the world’s great drummers – now drawing on his early jazz and swamp-rock influences to produce a sound that is integral to the Backsliders 21st century blues grooves. Rob’s achievements in the music industry are many and varied including In publishing his first work of prose on Pan McMillan – ‘Willies Bar & Grill’ telling the story of Midnight Oil’s USA & Canadian tour just after September 11. Joining Dom and Rob some of Australia’s most innovative and dynamic harmonica players; the legendary Brod Smith (Dingoes, Brod Smith’s Big Combo), ARIA award winning harmonica genius Ian Collard (Collard, Greens & Gravy) as well as young prodigy, Joe Glover. 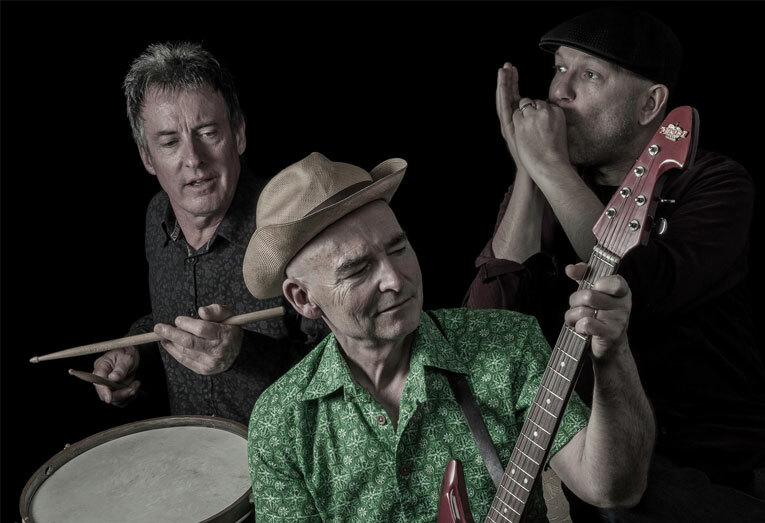 The 3 blues-harp dynamos play alternate gigs, each blazing a trail to the raw energy of the Backsliders sound. It’s a furious ride – with Dom Turner and Rob Hirst doing their thing, setting the grooves and taking no prisoners, and Ian, Brod or Joe (you never know who you will get) firing-up the amps to fuel the maelstrom. The achievements, success and reviews over the band’s 30+ years tell it all. The 2011 album, ‘Starvation Box’, their 12th release, was heralded as their finest work to date. The 2007 ‘Left Field Holler’ is an eclectic mix of hard-hitting, frenetic new blues mixed with poignant ballads again taking the band to new limits. The 2005 ‘Live’ album is a collection of live performances from the Basement in Sydney, as well as the Melbourne blues festival. The 2003 DVD, ‘Live at the Basement’ features live footage from one of Backsliders many gigs at The Basement in Sydney. The concert featured tracks from Backsliders’ 8th and latest album, ‘Hanoi’. Described as a new direction for a band that welcomes evolution and seems to expand their audience with every new release, ‘Hanoi’ was voted ‘Rhythms’ Magazine Readers Poll Blues Album of the Year for 2002 and was a 2002 finalist at the prestigious Australian Record Industry Awards (ARIA). ‘Hanoi’ is a studio album of mostly original songs by Dom Turner and Rob Hirst. The band’s previous album, ‘Poverty Deluxe’ (1999), was a 1999 ARIA Finalist. A variety of tunes from the Backsliders’ back-catalogue of recordings has featured in the ABC TV programme ‘Seachange’, as well as the soundtrack to the latest read by Tim Winton, ‘Dirt Music’ in particular ‘Down by the Riverbed’ from the Backsliders’ ‘Wide Open’ (1995) album. Backsliders have also appeared on a number of compilation albums featuring renowned international and Australian artists including the Byron Bay International Blues and Roots Festival and Live at the Basement Sydney, compilation albums. Backsliders have made numerous television appearances in Australia and are regulars at major Australian festivals – Womad New Zealand and Womadelaide, East Coast Blues Festival (14 appearances) Adelaide International Guitar Festival, the Melbourne International Music & Blues Festival (alongside Bob Dylan, Ray Charles & Tony Joe White), Woodford Folk Festival, Bridgetown Blues Festival the Festivals of Sydney, Melbourne, Perth and Adelaide to name a few. The band has played with international touring acts such as Peter Green, Junior Wells, Little Charlie and the Nightcats, John Mooney, Rory Block, Roy Bookbinder, Guy Clarke, Cephas and Wiggins, Leo Kottke, Charlie Musselwhite, Christina Olsen, John Prine, Del Ray, Steve James and toured nationally with blues legend, John Hammond..